Of the many symbols within Freemasonry; the Square and Compasses, the letter G for American Masons, the Skull and Crossbones for some of our European Brothers, the Triple Tau, the Double Headed Eagle and even the Cross in the Crown made famous by our Knight Templar Order may pale in complexity to what is said to be the most intricate symbol in Freemasonry, The Camp. I will say this, the Triple Tau is one complex symbol when dissected, it's many meanings unfolding into several parts, however The Camp, when taken apart, could be written volumes on each section. This is the first part in a series of short pieces which will attempt to dissect The Camp into a digestible format. First, I would like to mention that to many Freemasons, The Camp may not be something they have seen before. Even some members of the AASR (Ancient Accepted Scottish Rite), especially us in the Northern Masonic Jurisdiction may not have seen this, but don't let that stop you from reading. The Camp is called this because on the outside of the symbol are a series of tents set up in an arrangement around a shape. These tents represent encampments of Masons. Or a camp of Masons arranged in a particular order according to the degree being represented. • Five shapes; the nonagon, the heptagon, the pentagon, a triangle and a circle. Notice the 3,5,7 and 9. • On the nonagon, you have nine camps to which relate to the first 18 degrees, nine colors, nine letters and eighteen duties or lessons associated with it. • The heptagon has seven sides. 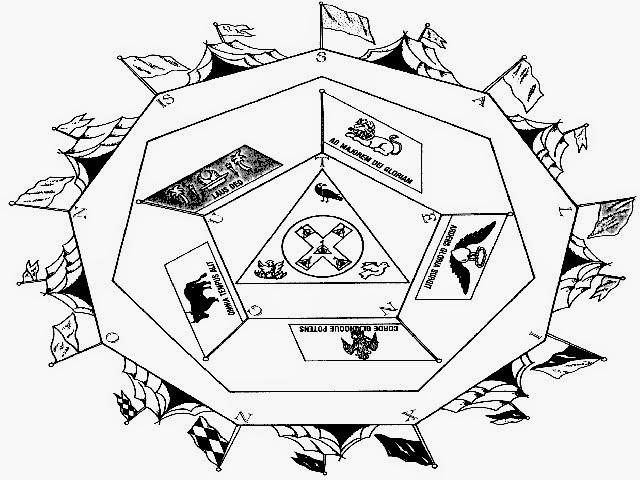 • The pentagon has twelve degrees, five letters, five pictograms and twelve lessons or duties ascribed to it. • The triangle has two degrees, three pictograms and two lessons or duties associated with it. • The circle has but one degree joined to it. • The St. Andrews Cross is in the center and alone. So far I have given you the most basic and intriguing explanation of this symbol and I hope you join me as I continue to take apart this symbol in its many facets over the coming weeks. I hope you enjoyed this very brief and tantalizing look at The Camp. In the next piece we will dive into the nonagon and all its parts. Until then, stay on the level. I was looking for more. we just learned to walk the encampment tonight, and will learn to work it next week. I was looking for a color breakdown that is easy to comprehend.